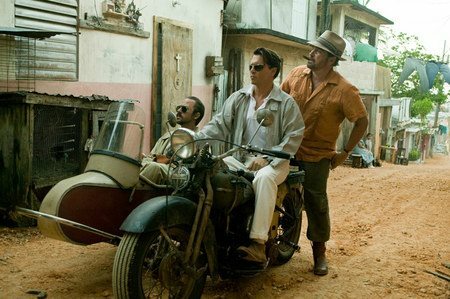 Download The Rum Diary in Digital HD from the iTunes store. 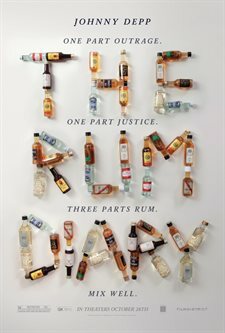 The Rum Diary images are © GK Films. All Rights Reserved. 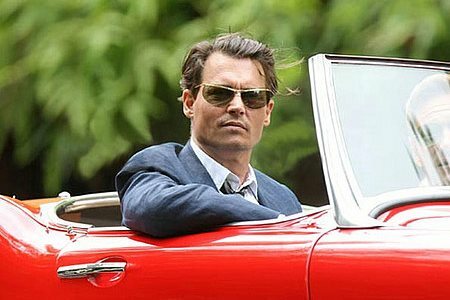 A testy screenplay that turns conventional upside down becomes an enjoyable madcap adventure with Johnny Depp's ‘intoxicating' performance. The daring filmmaking that takes a chance with the outlandish Hunter S. Thompson book The Rum Diary comes up a winner. Not a Fear and Loathing in Las Vegas, but a very good companion piece. Johnny Depp nails Hunter S. Thompson's oblivious character Paul Kemp in this sociopolitical drama making the sordid plot a delight to watch. Playing a more likeable character than he did in Fear and Loathing, where he was extremely over the top, here you'll have more feeling for Kemp, a confused and more malleable character that has no clue as to what he's getting into. Torn by extremely different surroundings from his last position as a reporter at the New York Times, Depp's character crumbles quickly to the wims of the Puerto Rican establishment that runs the awakening island. Bruce Robinson (Jennifer Eight) directs the ditsy story using every bit of Depp's talent to develop his quirky characters. Capturing Thompson's early 60's political scene of disenchantment with the United States in Puerto Rico, Robinson uses the sinking San Juan Star newspaper as his centerpiece to show Kemp entering a world very much unlike his former New York gig. Being a plum for the failing rag, Kemp quickly makes friends with a couple of staff members including Sala (Michael Rispoli) the staff photographer who has become very acclimated to the quirks of this island ‘paradise' who leads him down a primrose path. The highly character driven film takes a lot of twists and turns that show Kemp's naïve acceptance of the internal frustration of his fellow employees, discovering the greedy American Entrepreneurs and his fascination for Chenault (Amber Heard), a hot uncontrollable woman stuck in the world of her wealthy underhanded fiancée. Throughout this incredible life-altering interlude, Kemp drinks himself silly, slowly becoming a part of the island's madness and the popular insurrection he cannot avoid. The film has an outstanding performance by Respoli who makes his Sala a troubled man totally frustrated until he meets Kemp. Providing the catalyst for Kemp to get involved in a story to expose the shady dealings in San Juan, Respoli brings an amusing character to an otherwise disciplined story. As the half crazed writer Moburg, Giovanni Ribisi puts on an Academy Award worthy show. His offbeat, drugged out role gives Ribisi a chance to show of his incredible talent. The film is rated R for language, brief drug use and sexuality. The film also contains a scene of violence. It's a film buff's delight and a mainstream moviegoer's uncertainty, but if you stick with the pleasures of the craziness of it all you may find a real gem. FINAL ANALYSIS: A toast to Depp, Rabisi and Rispoli for the wacky dish. The Rum Diary images © GK Films. All Rights Reserved.